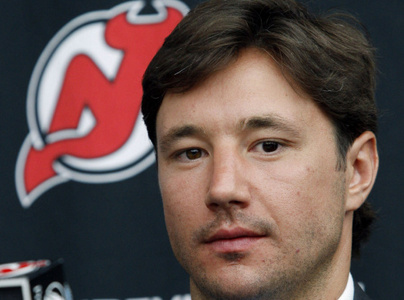 Hockey Plumber: Ilya Kovalchuk. Just How Much Will He Cost The Devils? Ilya Kovalchuk. Just How Much Will He Cost The Devils? Sure they have some key players injured, but when they come back, just how much better will they be? After several attempts by both the Devils and Kings, Ilya Kovachuk was finally re-signed by New Jersey. The result for Lou and crew was that the Kovy signing created a laundry list of issues that New Jersey will have to overcome, not only for this season, but also in the near future. That list is a daunting one. Signed and approved in September, Kovalchuk's deal put the Devils about $3 million over the $59.4 million cap. Speculation was rampant regarding how New Jersey would restructure their roster to get below the cap max. In the end, a couple of timely injuries allowed the team to essentially keep the roster intact, but then the season began. Big ticket free agent acquisition, Anton Volchenkov and forward Brian Rolston soon suffered injuries. Winger Pierre-Luc Letourneau-Leblond was suspended. How bad were New Jersey's cap troubles then? They had to... carefully read that: HAD TO place Letourneau-Leblond on waivers in order to make room enough for replacements on the roster. Straddling the cap max, New Jersey will face this situation all season long. Unlike the Rangers or the Blackhawks, Lamoriello & Co. seem unwilling to simply banish a high priced vet to the AHL or "loan" them to a European club to magically clear out cap space. For that, they deserve a bit of credit. As it stands now, only a "roster shake-up" trade can alleviate this situation. A trade which may prove difficult for the Devils to accept, as any trading partner would hold a great deal of leverage. Regardless of how this season plays out, the Kovalchuk deal directly affects New Jersey's options for next season's roster. The Devils will get some cap relief when Jason Arnott's bloated $4.5 million contract expires. Yet the team will be faced with more salary challenges. According to Cap Geek, the Devils will have 16 players under contract for next season, giving them approximately $8.3 million to spend. With the current CBA extended, it is expected that the cap will go up again for the '11-'12 season, so let us assume that the cap goes up another $4 million. New Jersey then would have $12.3 million to re-sign pending RFA and star winger, Zach Parise, fill the position of backup goaltender, 2 or 3 other forwards, and at least 3 defensemen. At first glance, it may not seem so unnerving, but consider that Parise, alone, will command at least half of the available cap room. Which will leave the Devils the task of filling the other 6 or 7 roster spot with $6 million or so. The remaining money situation means goodbye for team captain Jamie Langenbrunner ($2.8m) and probably even last year's break out blueliner, Andy Greene who will certainly be looking for more than the $737k he counts for this season. How will New Jersey lose Langenbrunner and Greene, add 6+ roster spots averaging less than $1m per player, AND improve on what has been thus far this season, a struggling club? The best hope for answering that last question lies within the Devils list of prospects. By all accounts, New Jersey has two top end forwards in talented Swedes, Mattias Tedenby and Jacob Josefson. The team had hoped that one or even both of them would be ready for NHL duty this season. Neither one was particularly impressive in camp. Josefson has been recalled from the AHL, but has failed to register a point yet through six games with the Devils. On the blueline, the team boasts many promising candidates for next season and beyond. With Matt Corrente, Alexander Urbom, Matt Taormina, Jon Merrill, Brandon Burlon, and Eric Gelinas,the Devils could potentially fill several roster spots... with talented players... at a low cost. New Jersey does possess hope here, but that is just what it is: hope. To ask 5 or 6 first/second year players to come in and make an impact on the big club is a very tall order. ...and what of that Kovalchuk guy? We have already established that his contract has hampered the Devils opportunities financially. Yet, what if he doesn't play up to his past performance level? 15 years is a long time! In 594 games with Atlanta, Kovalchuk scored 328 goals. That is a goal every 1.81 games. With about half a season under his belt in New Jersey, he has scored 13 goals in 39 games. Which works out to a goal every 3 games. Sure, it is a smaller body of work for comparison sake, but regardless of the sample size, or the reason for it, Kovalchuk just has not produced at the level he is accustomed to. What if he continues at that pace, which would net him an average of 27.333 goals per season? There hasn't been much evidence that he is ready to break loose. We know that the ticket for trading for him was promising forward Niclas Bergfors, steady defender Johnny Oduya, top prospect Patrice Cormier, and 1st and 2nd-round draft picks in 2010 . We know that the Devils were fined $3 million, that the club will forfeit their 3rd-round draft choice in the 2011 NHL Entry Draft as well as a 1st-round draft choice in one of the next four NHL Entry Drafts, as a result of their first attempt to re-sign Kovalchuk which the league deemed to be cap circumvention. We know that his deal has made for a fiscal embarrassment already this season, and that he has been benched by coach John MacLean. What we don't know yet, is what the end cost will be. A long-term albatross contract? The Playoffs for the foreseeable future? A coach? Lou?